There are a lot of photos of the dust storm that came over Sydney yesterday all over the internet. Here are a couple that I took yesterday as the sun was rising. I have a lot on my plate at the moment and a lot of changes around the corner. All of which it seems, I am going to have to deal with on my own. Soldier is to be deployed again for a short stint. With that in mind I am going to take a step back from all things internets and make a start on it all. Plus I am not really in the right headspace for much blogging at the moment. Behave yourselves while I am away! I am supposed to be cleaning for a house inspection tomorrow, but instead I will show you what I was doing this afternoon when I was supposed to be cleaning for a house inspection tomorrow. 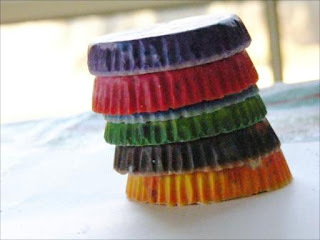 Noo has a lot of crayons. 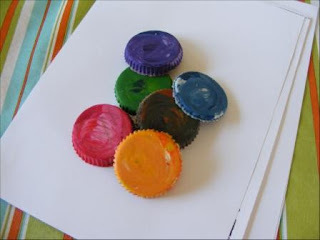 Lots and lots of broken crayons, that she wont use because, well, they are broken. 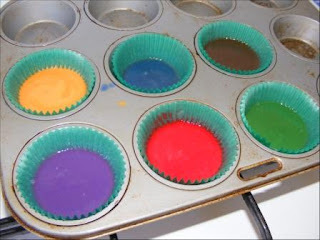 So I sorted the broken crayons into colour groups and put them in patty cases in an old muffin tin. and after a little stir. 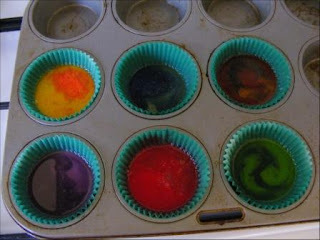 Then I let them cool down and little and threw them in the freezer. 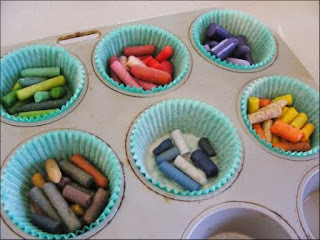 Now Noo has crayons that she will use. Until she breaks one, that is! Here is a list of things that come out of my mouth (and probably every other Mother's mouth) at least a dozen times each. Every. Single. Day! Please get off your brother's head. Did you flushed the toilet? Stop giving things to the dog through the hole in the screen door. Get out of the drawer. No, I don't know what that smell is. Stop throwing your food on the floor. No, it isn't breakfast/lunch/dinner time yet. Get out of the bin! Get your elbows out of me! I am considering recording myself saying these things, so I can leave it playing in the background. Either that, or, I will wait until their Father gets home and then pretend that I have lost the power of speech! It is right up my alley. I have been a fan of Cookie's forever. 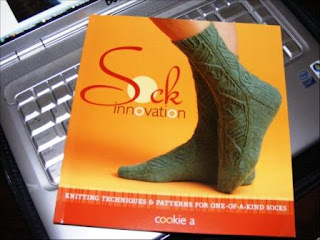 I especially love the first part of the book, where the process of designing a sock is spelled out. I have wanted to design a sock of my very own (I have tried and failed miserably) and this might give me the confidence and know-how to do it. I can see a pair of Sunshines, Kai-Meis, and Ricks in my sock drawer (that is if I had a sock drawer). Who am I kidding? I would love to knit most of the designs. I have had a very busy week. The Thursday before last I stayed up late waiting for Mum and Little Sister, who somehow managed to get themselves lost on the way from the airport to my place. The next day we took ourselves off to see P!nk again. We had the best seats in the place. I really don't think we could have done any better. She was even better second time around too. I admit to a little crush! Mum went home on Sunday. Then on Tuesday, Little Sister, Noo, The Boy and myself boarded a aeroplane to the Gold Coast. Where we spent two sun-filled days at Dreamworld and White Water World. We also caught up with our cousin, whom I haven't seen for three years. She hadn't met my youngest and I hadn't met hers. On Saturday Mum, Dad and Nana arrived from North Queensland and last night we went and saw John Farnham perform. Little Sister and I bought Mum tickets for her birthday in July. We had a great time and I can honestly say that the only thing he has lost is some of his hair. Today we waved them all good-bye and I have my house back! No-one sleeping on the couch, and no suitcases everywhere. I love having visitors, but they really do disrupt your routine. On another note, I have started the purple socks for Little Sister's friend. 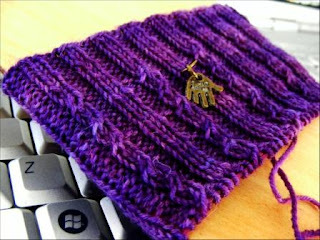 But there has been little time for knitting, so I have only managed to knit about two dozen rows on both cuffs. I am enjoying the pattern and they are looking really good.